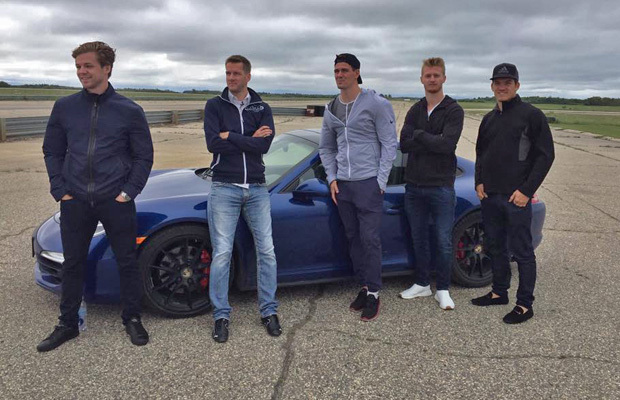 Josh Morrisey, David Richert, Mark Scheifele, Kyle Connor and Jack Roslovic with the Porsche 911 Carrera 4S. In support of KidSport Winnipeg, local race car driver David Richert gave some helpful driving instructions to Winnipeg Jets Mark Scheifele, Josh Morrissey, Kyle Connor and Jack Roslovic – experiencing racing first hand. The sweet sound of a Porsche 911 roaring around the curves was briefly interrupted by the thumping sound of rotor blades beating against the cool morning air as a helicopter carrying special passengers descended from the clouds above Gimli Motorsport Park. Exiting the helicopter like rock stars were Winnipeg Jets Mark Scheifele, Josh Morrissey, Kyle Connor and Jack Roslovic. Waiting to greet them was a deep blue Porsche 911 Carrera 4S along with professional race car driver David Richert who was ready to introduce them all to his world of speed. The entire event was being held in conjunction with the Mark Scheifele Golf Tournament in support of KidSport Winnipeg’s initiative to help remove financial barriers preventing children from playing organized sport. At last year’s tournament, Kevin Stobbe took the winning bid on an auction prize that saw him receive driving instruction from Richert earlier in the morning. With Derek of Prairie Helicopters circling overhead, each player had the opportunity to experience a fast lap with Richert at the wheel before they enjoyed the experience of driving themselves under Richert’s careful instruction. Morrissey was all smiles throughout the event and responded when asked if he had ever gone that fast before, “No, definitely not. But it was pretty cool. A lot of fun!”. Richert, who last year became one of the only Canadians to ever finish a race through the streets of Monte Carlo at the Monaco Grand Prix weekend, was full of praise for everyone who got behind the wheel. The day wrapped up with everyone enjoying a delicious lunch supplied by Danny’s Whole Hog and then it was back to the chopper for the short flight to Winnipeg.